With the ever increasing number of websites on the internet, many new solutions for beginners and novice webmasters to create and deploy sites within minutes have been launched. Yes, we are talking about “website builders”. While the importance and usefulness of a properly coded and designed website by a professional can never be understated, such website builders tend to prove very helpful to beginners and people who don’t have the money to employ a web design freelancer or web development company. They are particular useful to small business which need a simple brochure style website, such a website would contain information about the company, information about their products or services offered, a contact form, maybe an image gallery and other standard website pages. 1 What is a Website Builder? 2 Which is the Best Website Builder? A website builder is simply a tool which allows you to construct a website with any manual HTML code editing.They will typically allow you to add different elements to a page using a drag and drop interface so you can build the website visually. They will allow you to place items like images, text blocks, lists, quotes and change their appearance by editing colors, sizes, font choices and so on. Website builders can be online based or an offline tool, in this post we are looking at online website building services and trying to determine which is the best website builder for you. We shall be taking a comparative look at four online website builders: Wix, Weebly, Squarespace and Virb with a view to answering the question: Which is the Best Website Builder in 2017? If you need a quick comparison, check out our table of which we think are the best Website Builders in order from best. Read more below for details about each service and the pros and cons of each. Wix has been around for quite a while and is a very popular name in the world of website builders. It comes with both free and premium plans and offers a good number of tools to help you build your website. Essentially, Wix operates by means of a drag and drop interface wherein you select the elements that you wish to add to your web page and then drag the said elements on to the page. The interface is easy to understand and nimble to operate. Plus, you also get to choose from a wide library of templates ranging from blogging to eCommerce to even corporate websites and magazine publications. Every single template at Wix is responsive and mobile-friendly. The best part about Wix is that it gives you a plethora of addons that you can integrate with your website. Need a mailing list managed via MailChimp? How about some better integration with your Facebook page? Already running a digital shop on Shopify? Wix can integrate your website with multiple such external services all in a matter of a few clicks. That said, the customization offerings are dual-edged sword. Not many users would need all the features and the high level of external services might seem overkill for many folks. Wix offers a free plan with 500 MB of storage and 1 GB bandwidth. It is ad-supported and you are given a subdomain.wix.com website, pretty much like WordPress.com Premium plans start at approx $4 per month and with additional storage and bandwidth quota, they go higher. Weebly is another worthy and popular name in the field of website builders. 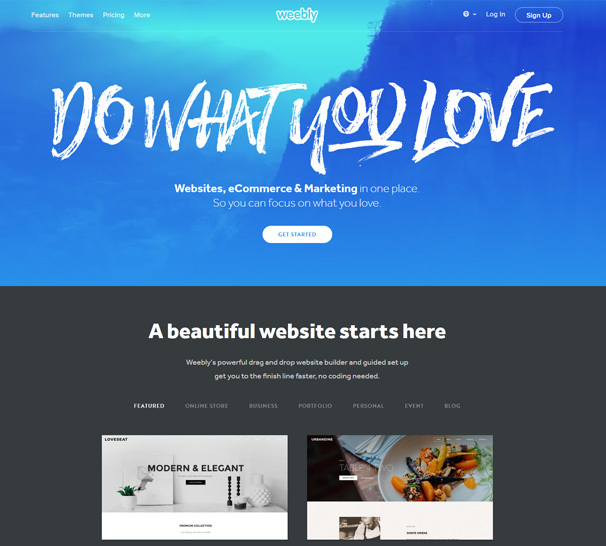 Weebly began back in 2006 and over a decade later, it has evolved into a proper site builder that is capable of handling even the busiest of eCommerce stores. Weebly was, initially, a simple solution to website management. You would create your website that spanned a few pages, or a small blog. Using Weebly for trickier projects was not the preferred approach. However, it is rather robust now and over time, Weebly has managed to keep up with web design trends. You would find features such as video backgrounds, detailed website statistics, abandoned cart recovery for eCommerce stores, custom billing emails as well as marketing automation solutions. Weebly too operates by means of a drag and drop editor, albeit advanced features require you to delve deeper into settings and management actions. It integrates well with third party products and has its own mobile applications to help you manage your websites. In terms of pricing, Weebly has plans that start from $8 per month and go up to $38 per month. The difference lies in eCommerce features mostly — the $38 plan has shipping and inventory management as well as zero transaction fees, whereas the $8 plan lacks these features. There is a free plan too with 500 MB of storage and a weebly.com sub-domain. All the paid plans, however, come bundled with a free domain. 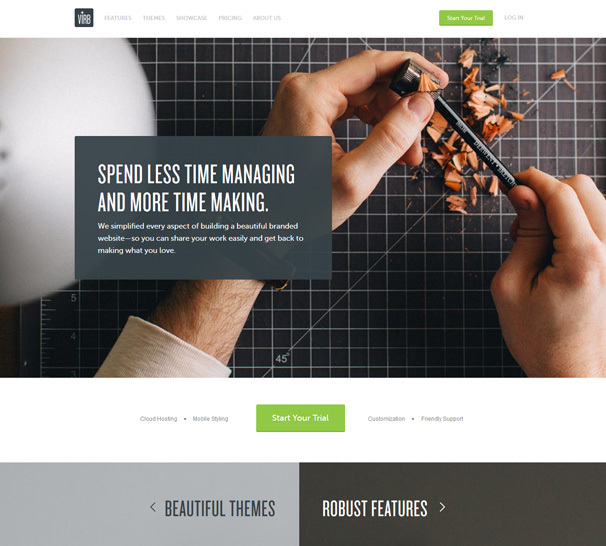 Squarespace, the third entry on our list, caters primarily to folks looking for portfolio and other creative websites. 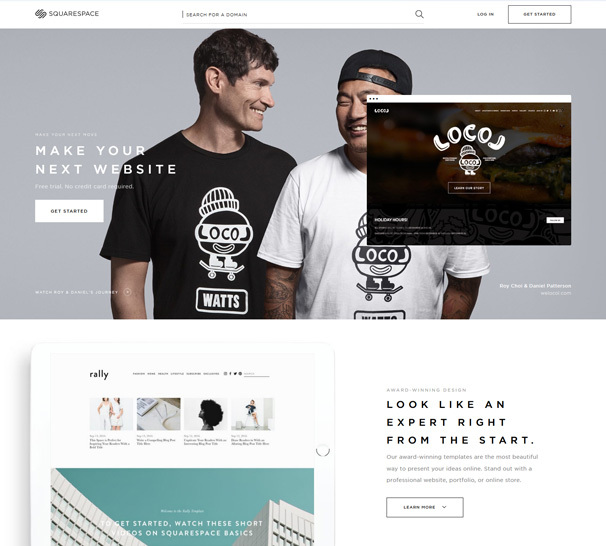 If you wish to create an online location to showcase and possibly sell your work, Squarespace might be a good fit. Everything at Squarespace seems modeled for portfolio sites, photography projects, and other creative work. The templates are mostly minimal, rely heavily on featured images and clean typography, and so on. The eCommerce features too are not lacking. In fact, Squarespace distinguishes between regular websites and eCommerce sites. If you are creating an online store, you can choose between the $26 per month or $40 per month plans. Both come with free domains, zero transaction fees, and several other features but the bigger plan has shipping and inventory management features. On the other hand, a regular site means you can choose between the $12 per month or $18 per month plans wherein the former has limits on the number of projects and posts you can add but the latter is unlimited. The biggest downside is that Squarespace has no free plan (there is a free trial, though). Furthermore, pricing is steep and comparatively costlier than others. With that said, Squarespace is pretty good at what it does and if you are wanting to create a portfolio site, Squarespace is a worthy option. Virb is owned by Media Temple, an enterprise-grade web hosting company that is in turn owned by GoDaddy. This is a double-edged sword. On the positive side of things, Virb is backed by giants and that can be implied to mean that Virb is going strong. However, the real picture is slightly different. Virb started as a promising and rather useful website building solution. But after it was acquired by GoDaddy, there have been not many new innovations and features. In essence, Virb is still where it was over a year and half ago. Virb does not attempt to project itself towards a specific niche, be it portfolio sites or eCommerce. Virb is, therefore, an everyman’s website builder minus the versatile set of features that Wix has to offer. Virb has a drag and drop editor and is extremely simple to use but owing to the lack of tighter eCommerce integration, it is best suited for simpler websites. Also, Virb follows what might be the world’s simplest pricing structure — there is just one plan at $10 per month. You get unlimited pages and storage as well as SEO features and basic eCommerce offerings, and that’s all. In fact, you won’t be able to pay per annum either — $10 per month means just that, there are no other billing terms. Now that we have covered four website builders in detail, namely, Wix, Weebly, Squarespace and Virb, which one beats the rest? Virb seems too dated and low on features to compete with the other names. Squarespace is a decent solution by all means, and you cannot possibly go wrong with Squarespace if you decide to go with it. However, its higher cost can be a deterrent for many users, especially because the pricing we are talking about is a recurring structure. Weebly and Wix seem to go head to head as far as features are concerned. Even their free plans are almost identical with both being ad-supported and restricted to very little storage. In such a case, Wix emerges as the winner by a small margin, owing to its better integration with third party solutions. Furthermore, Wix has a slightly more diverse template library. 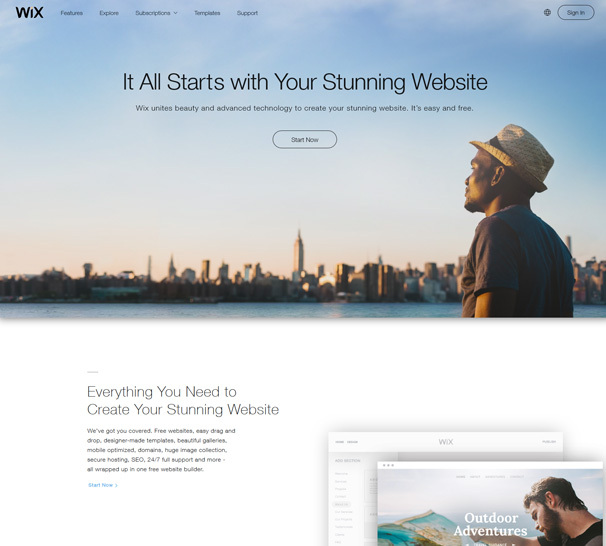 So there you have it, we choose Wix as the Best Website Builder currently available today. Why are you planning to use ? Share your views in the comments below.